A melting pot of culture and history! 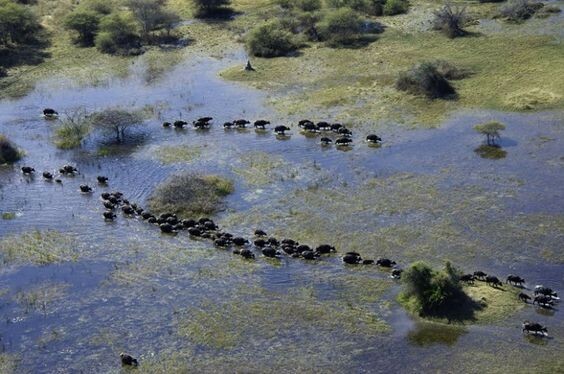 Arrive in Maun international airport where you will be met by Ethnic Nature Tour safaris guides off air Botswana Maun is the gateway to one of the best wildlife experiences you will ever have safari in the unforgettable Okavango delta. The cosy town Maun is a perfect starting point for exploring the remote pristine areas of the Okavango Delta and the surrounding national parks and game reserves like Moremi Game Reserve, Savuti, Chobe National Park, Makgadikgadi Salt Pans, Nxai Pan and Central Kalahari Game Reserve. On request we also offer tours to other parks and reserves in Botswana like Khama Rhino Sanctuary. Also we can organize excursions to Victoria Falls in Zambia as part of a tour. 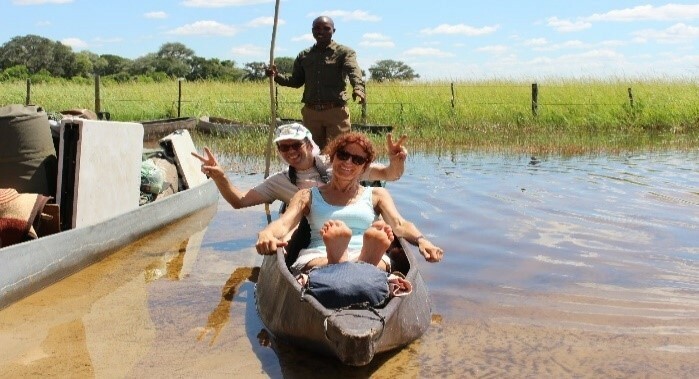 Mokoro trips have become the popular way for travelers to experience the tranquillity of the Okavango Delta. A trip by ‘Mokoro’ either a traditional/fiberglass dugout canoe is central for the tourists to experience in the delta. The mokoro was introduced by the Bayei people in the 18th century. Depart from your campsite at 07:00 am; arrive at Boro mokoro station at 08:15am on an open 4WD Safari Vehicle en route to the Delta where you will meet your local mokoro pooler for a peaceful and relaxing mokoro journey taking in the sights and sounds of the Okavango Delta. This activity is conducted by local mokoro community guide .Mokoro meaning (the traditional Aquatic mode of transport, dugout canoe) who will take you through the water channels listening to bird’s calls. Bird life is quite spectacular; Hippos and crocodiles are also a usual sight. It takes about 2 hours to reach the island. Roughly you will arrive at the Island between 10 and 11 am depending on what you saw on the way. When you arrive you take a quick rest and stretch your legs and then you take a three hour walk on the Island where you will see some animals, for example Zebras, Elephant, Buffalos, Impalas, Giraffes and many more depending on the day. At times we encounter lions. Guides are very brilliant; they will explain lot of things to you about the animals and the entire environment. We then have a stopover for lunch. After eating you learn how to Pooler the mokoro. From there we Poole back to the mokoro station where we find our vehicle waiting for us. We are going to camp here for two nights. 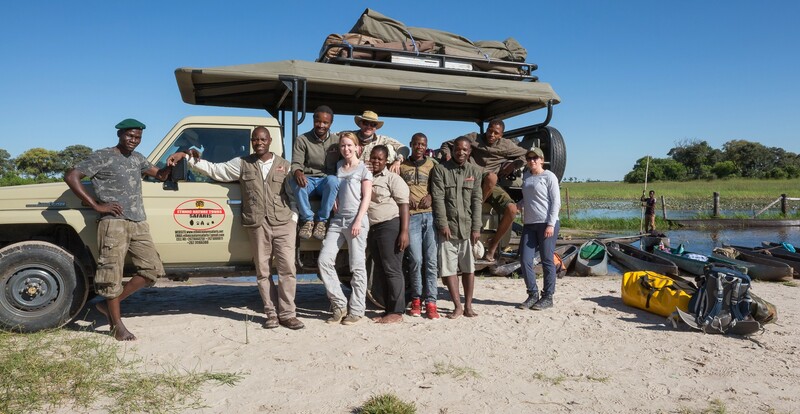 From Maun we depart to Moremi/Khwai, situated in the eastern part of the Okavango Delta, bordering the Chobe National Park on the south-western part of the Park. The Moremi Game Reserve covers almost one third of the Delta. The Okavango Delta is the largest inland river delta in the world and consists of pans, floodplains, lily covered lagoons, grasslands, forests of acacia trees, savannahs and dense Mopane Woodlands. With such a wide variety of vegetation comes diverse spectrum of wild life. Huge herds of impala and tsessebe are found in the area, while in the dry season large herds of buffalo, wildebeest, elephant and zebra flock into the reserve from the Kalahari in search of food and water. The rare sitatunga and lechwe antelope live in the papyrus banks of the waterways. 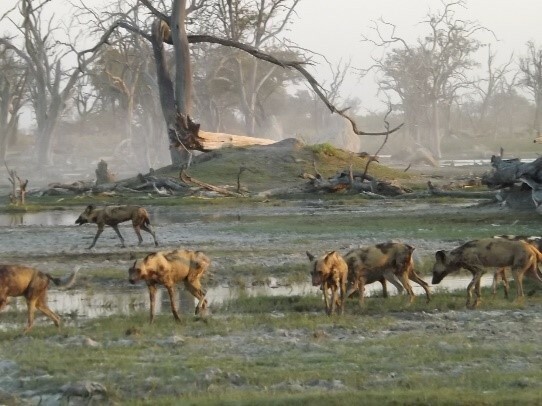 Lions, cheetahs and packs of wild dogs hunt in the open grassland. The reserve is home to over 400 species of birds, including the African Fish Eagle, the Crested Crane and the Sacred Ibis. 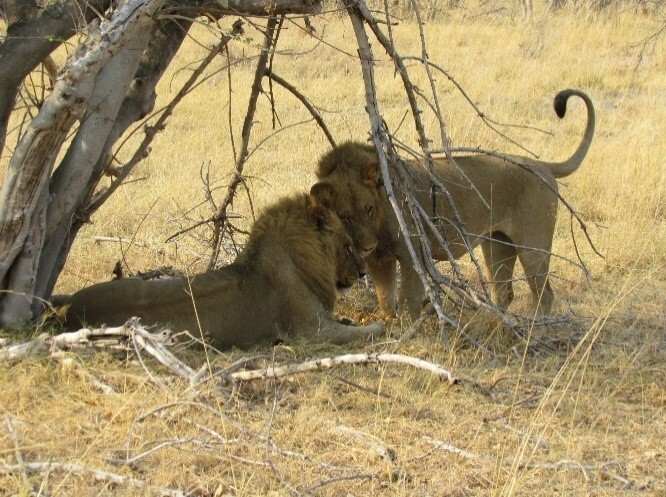 Moremi Game Reserve is a wilderness paradise with great game viewing throughout the year. 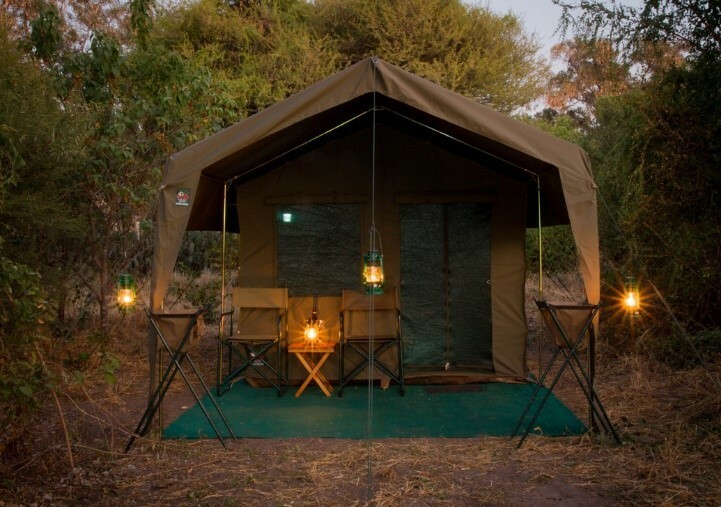 We will camp wild for 1 night at an exclusive campsite at Khwai north Moremi Game Reserve, enjoying activities. The magnificent Khwai River is the hub for some of the most outstanding wildlife viewing both on the Moremi and in the Khwai community area. The camp will be set-up upon arrival at the camp site. The campsite is where you will be having all your meals as well. 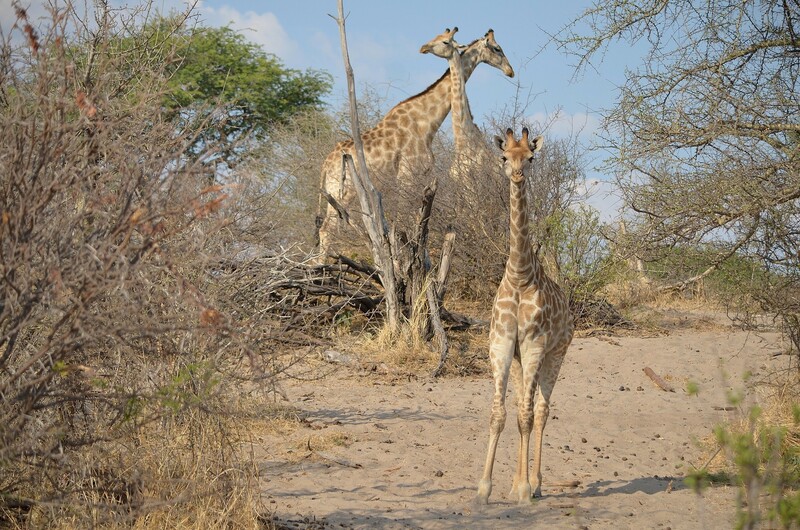 Here you will get to do 2 game drives, the first game drive you will do it as you enter the park and the second game drive will be done later in the day after having high tea around 1500 hours that is when you will get to go on your evening game drive. From the game drive you will find your water ready for your shower and your dinner ready. You will have dinner at 2000hrs. After dinner you can relax around the fire with our staff or you can retire to bed. Wake up at 05:00am and have breakfast at 05:20am. Depart for your morning game drive. Moremi looks beautiful. With such a wide variety of vegetation comes diverse spectrum of wild life. Huge herds of impala and tsessebe are found in the area, while in the dry season large herds of buffalo, wildebeest, elephant and zebra flock into the reserve from the Kalahari in search of food and water. The rare sitatunga and lechwe antelope live in the papyrus banks of the waterways. 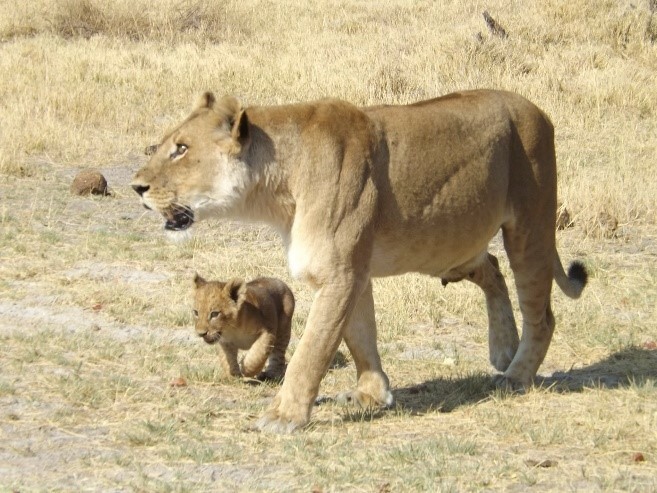 Lions, cheetahs and packs of wild dogs hunt in the open grassland. 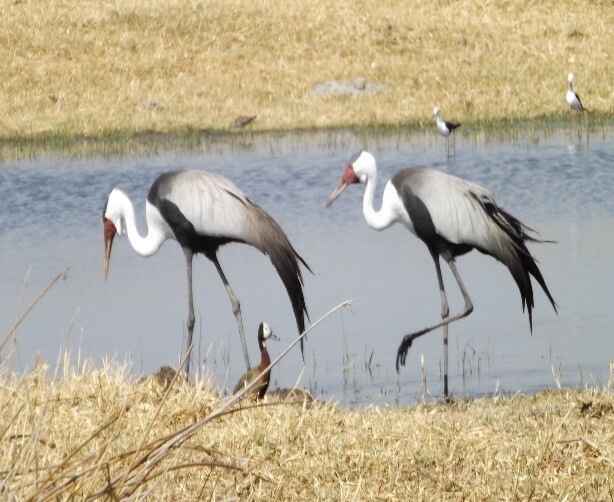 The reserve is home to over 400 species of birds, including the African Fish Eagle, the Crested Crane and the Sacred Ibis. 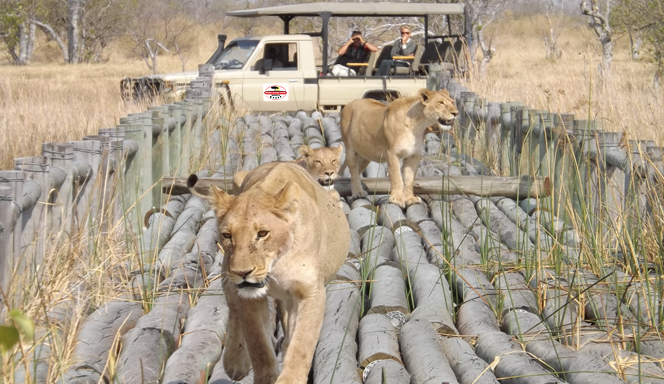 Here you will get to do 2 game drives, the first game drive you will do it as you enter the park and the second game drive will be done later in the day. Around 15:30 hours you will get to go on your evening game drive. We depart to Savuti from Khwai. It is called Savuti because a certain chief called sauté used to live there with his tribe. On the way we will see migration of zebras and wildebeest which will be coming back from the Makgadikgadi salt pans after the rains. Tawny eagles can be seen soaring in the sky as we go. The drive is a bit longer from Moremi to Savuti, however the drive is much enjoyable as you will see lots of birds and animals on the way. The scenery is amazing and very African looking, with lots of umbrella thorn, acacia tortilis and many more including the most photographed bird, lilac breasted roller a national bird of Botswana. You will not resist from taking a pictures, it’s the most beautiful place in Africa. 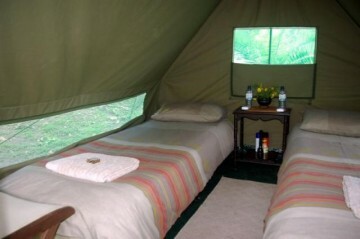 We arrive in time for lunch; our exclusive camp will be put up while you have Brunch. We wild camp for 2 nights depart for an afternoon game drive to see vast herds of zebras and wildebeest and also have an opportunity to see pairs of kori bastards which are the heaviest flying birds. We get back to camp after sunset for a lovely dinner around the camp fire. depart at 15:30hrs for game drive. We will be back from game drive after sun set which we will have been enjoyed under a baobab tree (adonsonia digitata) an indigenous tree found in Africa, it is nick named the upside down tree, because the branches look like roots when it is dry or doesn’t have leafs. 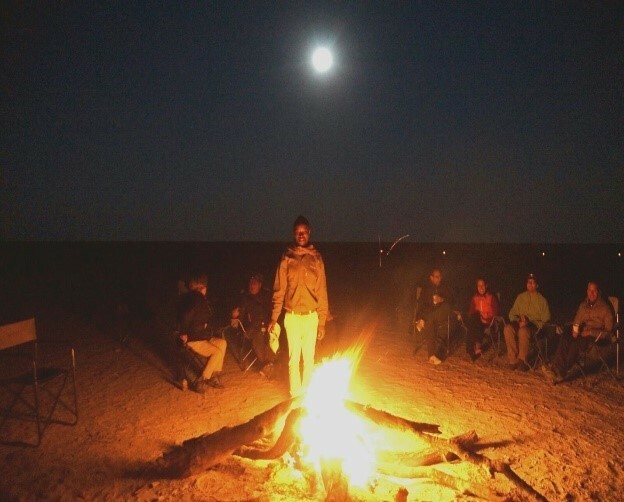 You will return from the game drive around 1900 hours in the evening and then you will have a chance to take a shower and have your dinner at 20:00pm. Wake up at 0500hrs and have breakfast at 0530hrs. You will go for your morning game drive. 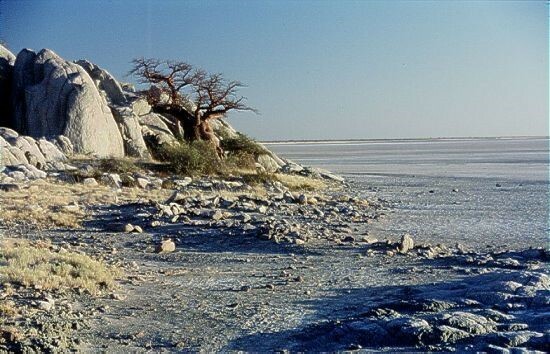 The Makgadikgadi Pans, is situated in the middle of the dry savanna of north-eastern Botswana. It is one of the largest salt flats in the world. The pan is all that remains of the formerly enormous Lake . 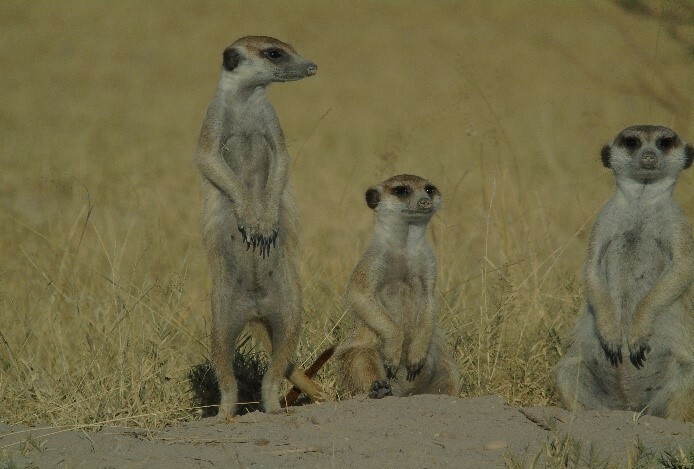 Makgadikgadi. 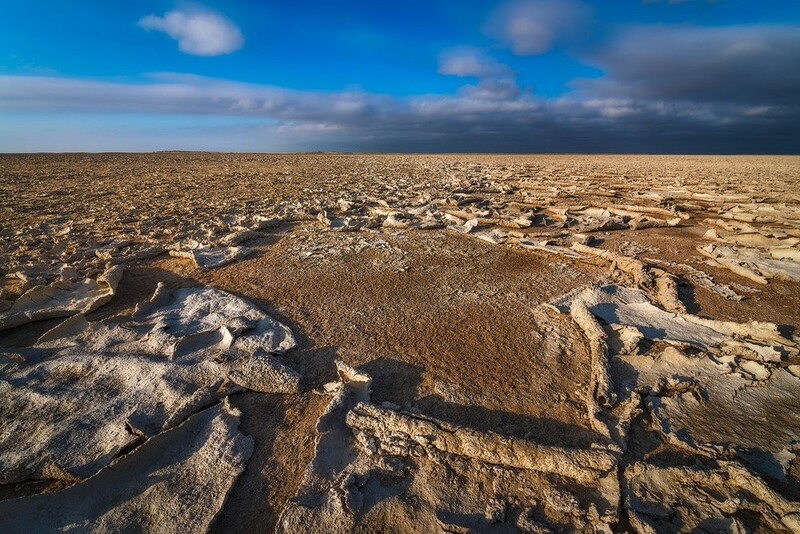 Lying southeast of the Okavango Delta and surrounded by the Kalahari Desert, Makgadikgadi is technically not a single pan but many pans with sandy desert in between, the largest being the Sua (Sowa), Nwetwe and Nxai Pans. The largest pans themselves are salty desert whose only plant life is a thin layer of blue-green algae. Have your stopover for your lunch as you prepare to head back to camp where you will find hot water ready for you. Dinner will be served at 1900hrs. Bedtime is determined by last guest to live. Wake up at 0600hr and have breakfast at 0630hrs. Depart to the Airport where you will catch an outbound flight.